Monday 2nd March: Weekly technical outlook and review. Weekly Timeframe: Last week saw active selling come into the market from just below weekly supply at 1.1678-1.1458. This consequently saw the Euro print a full-bodied bearish candle stretching almost 200 pips from open (1.1388) to close (1.1189). Assuming that the sellers can continue with this tempo, we see very little reason why price cannot retest the weekly Quasimodo support level this week at 1.1109. Daily Timeframe: The daily timeframe shows that the majority of selling was seen on Thursday (news related), which consequently took out a small daily demand area at 1.1260-1.1318. 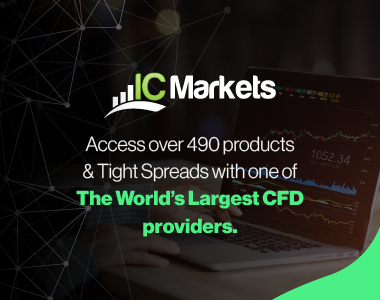 This move is significant in our opinion, owing to the fact that this daily demand held the market higher since the 4th march! With this zone out of the way, the path south is very likely free this week for price to challenge the daily demand area coming in at 1.1045-1.1127 (encapsulates the aforementioned weekly Quasimodo support level). 4hr Timeframe: For anyone who read our last report on the Euro, you may recall us mentioning that if price were to close above the 1.1200 mark, we’d then begin looking for price to retest this level as support and rally up to 4hr supply at 1.1262-1.1240, which as you can see, did happen. Unfortunately though, we were unable to find an entry long here to take advantage of this move, well done to anyone who did! The Euro ended the week closing below and retesting the 1.1200 level as resistance. Providing that the sellers can hold out below 1.1200 today, our team will ultimately be in ‘short mode’. With lower timeframe confirmation, we’ll happily short down to the mid-level number 1.1150 marked in yellow, which will be our first take-profit target. 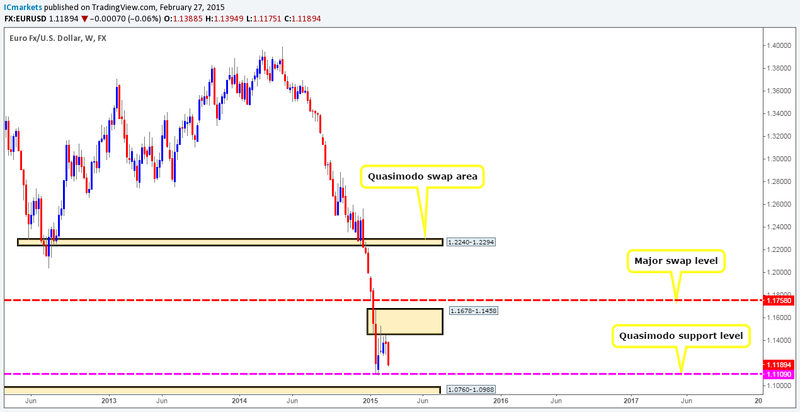 In the event that price continues lower, our second and final take-profit target will be set just above the weekly Quasimodo support level seen in pink at 1.1109. Some of you are probably thinking that it may not be wise to consider shorting the market when price is so near to a weekly support. You could very well be right. Nevertheless, what gives us confidence here is that price took out a relatively supportive daily demand area coming in at 1.1260-1.1318 (see above), which, to us, shows that most of the buying pressure is likely consumed and price may sell off. Sell orders: currently watching for lower timeframe price confirmation around 1.1200 (Predicative stop-loss orders seen at: dependent on where one confirms this level). Weekly Timeframe: The weekly timeframe saw relatively strong selling come into the market last week deep from within a major weekly swap area positioned at 1.5426-1.5561. In the event that further selling is seen this week, price could potentially hit a weekly swap level seen at 1.5270. 4hr Timeframe: The 4hr timeframe has been, and still is trading within a 4hr ascending channel (1.5343/1.5195), which is clearly being respected at the moment. Contrary to what the higher timeframes are saying, the 4hr chart is in what we like to call a ‘buy zone’. This comprises of a 4hr demand area seen at 1.5331-1.5384, which, as you can see, not only encapsulates the aforementioned daily swap level, but also converges beautifully with the lower limit of the 4hr ascending channel (see above). Given that the weekly chart is showing price trading around supply at the moment, and the daily timeframe action is currently meandering around questionable support (see above), we have decided that any buys taken from the aforementioned 4hr demand area will need lower timeframe confirmation and easy-to-reach targets, as you do not really want to be caught on the wrong side of the weekly timeframe! In the event that this 4hr demand area is consumed this week, the path south will likely be free down to at least the 1.5300 level, which, if you remember from the weekly timeframe is only 30 pips above a major weekly swap level at 1.5270. Buy orders: currently watching for lower timeframe confirmation around 4hr demand at 1.5331-1.5384 (Predicative stop-loss orders are seen at: 1.5327). Daily Timeframe: Last week saw the buyers fake price above the 0.7844 daily swap level, which, as you can see, happens to be the upper limit of a three-week long range (0.7691/0.7844). This push higher has likely consumed both the buyers attempting to trade the breakout, and also sellers trying to fade, thus likely opening the gates for price to challenge a small, yet clearly resilient daily supply area seen above at 0.8050-0.7994. 4hr Timeframe: Like the GBP/USD, the AUD/USD pair has been, and still is trading nicely within a 4hr ascending channel (0.7643/0.7827). Given the recent strength seen on the daily timeframe last week, and the fact that price is still trading just above weekly demand (see above) at the moment, our main focus for today, and possibly the rest of the week will be primarily looking for buy trades. It remains untouched, relatively fresh. This area of demand was also very likely where the decision was made to break above the aforementioned daily range (see above), and as a result, there are very likely unfilled buy orders left here just waiting to be tapped. Additional support is being seen from a mid-range 4hr Quasimodo support level marked in green at 0.7756. Waiting for confirmation around this 4hr area is recommended. Targets for this trade (if an entry single is seen that is) are as follows: the round number 0.7800, the daily swap level 0.7844, and finally the 4hr supply area coming in at 0.7905-0.7881. However, let’s not forget that price is trading around weekly demand and could effectively go much higher! Buy orders: 0.7768 [Tentative] (Predicative stop-loss orders seen at: 0.7733).